At HBC we believe every building is a living organism capable of promoting health and wellbeing to its users. Healthy and wellness oriented buildings are the next step of sustainability. 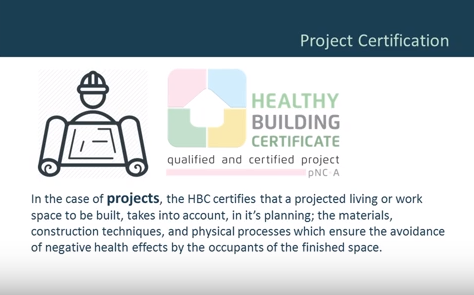 Built environments approved in strict health standards by methods such as measurement with validated appliances, laboratorial physicochemical analysis, documentary evidence, and others will be able to receive the Healthy Building Certificate. 1st)tthose which have already passed the previous stage of certification and received the Healthy Building Certificate for projects (project certification is extinguished at the end of the work, in the release of the permission for occupancy). selo ambiente epe2st) t those which have not received the Healthy Building Certification in their project phase, but wish to certify the completed construction phase, including older properties. Items such as electromagnetic fields, air quality, and ventilation, including the presence of volatile organic compounds, fungi and bacteria, water quality, quality and quantity of light, acoustics, landscaping, sustainability, and healthy maintenance will be surveyed. we've been in contact with.